The Friday seminar is part of the Designated Emphasis in Biotechnology program, what everyone refers to as “the DEB.” Every week there’s a different speaker with a different area of specialty in the biotech industry. 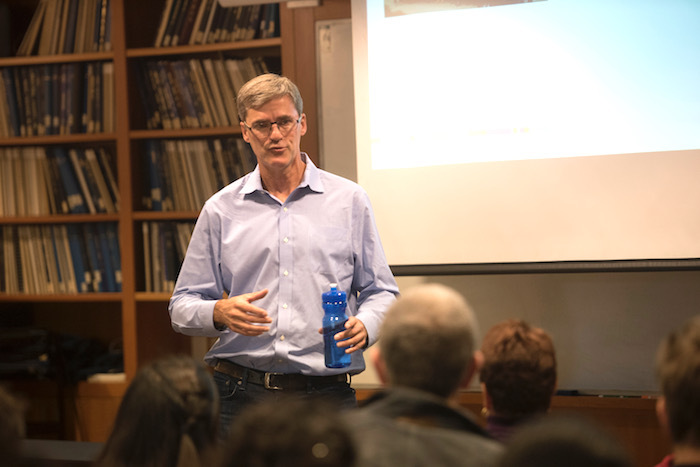 Earlier in the quarter, industry experts presented seminars on intellectual property, building a biotech startup, producing a profitable probiotic and pioneering a novel class of antibody therapeutics for cancer. Today the students are there to hear Erik Karrer, director of target discovery at 23andMe. Karrer is an alumnus — he received his Ph.D. in genetics in 1992 — which is part of the draw for the graduate students. Karrer has been where they are and now has a career in the biotech industry. Judith A. Kjelstrom (a.k.a. Dr. Judy), director of the UC Davis Biotechnology Program, attends the seminar and seems to know all the students. Kjelstrom, too is an alumna — she received a Ph.D. in microbiology from UC Davis in 1992 — and has been running the program, which includes the DEB, since 1999. Karrer begins his presentation by saying he’s happy to be back on campus, and then talks about his research, how 23andMe is trying to identify potential therapeutic drugs by using genetic data from their approximately 3 million customers. About 85 percent agree to allow their genetic data to be used anonymously for research, which has given the company what Karrer refers to as an unprecedented amount of data. “About 850 million phenotypic data points,” Karrer says. He puts up slides that show cohorts with different diseases — Parkinson’s, asthma, cardiovascular disease, colorectal cancer. Students listen closely, taking notes on their laptops. Karrer is a low-key presenter, but he is clearly excited by his research. His slides use nonproprietary data to show how the genetic data in these clusters may help contribute to finding therapeutic drugs. He also discusses the kinds of cost/benefit decisions a company has to make before pursuing a potential drug — is there an unmet need? What does the competitive landscape look like? What about safety considerations? When Karrer is concluding his 45-minute talk he says, “I have the best job in the world.” He tells the students 23andMe is hiring for many types of positions, including the engineering, research and therapeutics teams. And especially, he says, in computational biology and statistical genetics. “We cannot hire enough of these people,” he says. There are a couple questions, but then the time is up and students begin to stash their laptops, gather up backpacks. A few of the students go up to ask Karrer questions. Kjelstrom invites several students to lunch with Karrer at the Gunrock Pub on campus where they can talk one-on-one with him. It all feels like a very ordinary seminar. But, in fact, the UC Davis Biotechnology Program and the DEB program are anything but ordinary. The Biotechnology Program was founded in 1986 to provide an organizing hub for biotechnology efforts on campus. UC Davis remains the only University of California with a stand-alone biotechnology program. In fact, it is one of the only cross-disciplinary programs like it in the United States. The program creates a critical bridge between academia and the biotech industry as well as government entities involved in bioscience. The biotechnology industry is substantial and growing rapidly. A 2017 report from Grand View Research projects that the global biotech market will reach $727 billion by 2025. Bioscience firms in the United States employ about 1.6 million people according to a 2016 report by the Biotechnology Innovation Organization. According to the same report, California has the nation’s largest bioscience industry employment base, with more than 242,000 jobs. And the industry is diverse. In addition to pharmaceuticals, the industry also creates products for agriculture — such as crops and seeds — and for industry — such as biofuels, enzymes, biomaterials and biochemicals. Trying to start a career within such a large and dynamic industry presents both opportunities and challenges. Helping UC Davis doctoral students find their niche and not get lost is where the UC Davis Biotechnology Program comes in. The DEB, which is celebrating its 20th anniversary this year, is one of the Biotechnology Program’s key offerings, supplementing a student’s Ph.D. curriculum with real-world connections and exposure to industry. It started in 1997 with just 10 students. Twenty years later, 266 students have gone through the program with 228 currently enrolled. The program attracts a large number of life science and engineering students, but it is truly cross-disciplinary. About 250 faculty from a wide variety of disciplines are affiliated with the DEB, and the students participating are from 29 different doctoral programs, everything from biochemistry to plant pathology to immunology to electrical engineering. To receive the Designated Emphasis in Biotechnology on their diplomas, doctoral students complete a core course, seminar series, bioethics course and a three- to six-month internship. The program also includes an emphasis on developing communication skills (through recommended presentations and community outreach); networking (through retreats, luncheons and other events); and creating a professional CV. Kjelstrom’s approach to running the Biotechnology Program and the DEB is to focus on understanding the passions and skillsets for each student and help guide them toward the best path. She says she tries to light a fire they did not know they had. Amanda Dang learned about the DEB before she applied to UC Davis. “It piqued my interest because it seemed like a unique opportunity to learn about the biotechnology industry and pursue interdisciplinary research.” Now a fourth-year Ph.D. student in the Department of Materials Science and Engineering, she has attended about 15 DEB seminars. Her favorite so far was given by the director of toxicology at Genentech, who, she says, shared her personal story as well as the innovative research being conducted by her team. 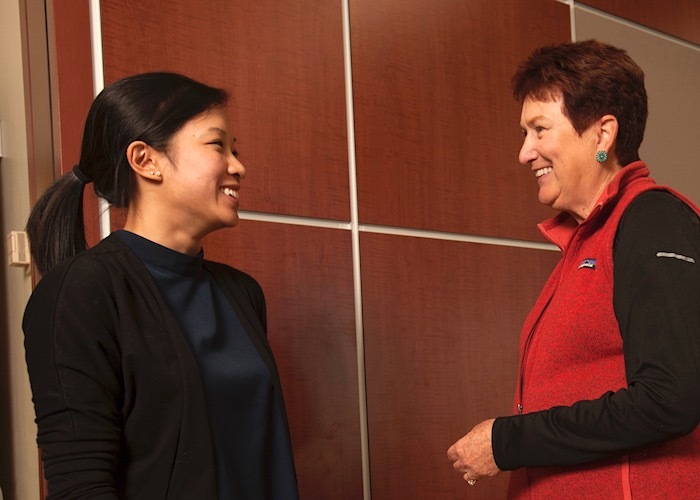 “Her talk exposed me to a new, yet relatable perspective that clarified my understanding of what it would be like to work in the biotechnology industry,” Dang says. Kjelstrom is also a “technology broker,” cultivating industry and government contacts in order to place students in internships and jobs. “We place 30 to 40 students per year in internships,” she said. Some of the companies the program has developed long-term relationships with include industry icons like GlaxoSmithKline, Genentech, IBM, Amgen, Bayer, Pfizer, and Takeda Pharmaceuticals, as well as more recent startups, like Second Genome. “Companies now reach out to us because of the things they have heard about our program,” Kjelstrom says. She tries to give students as much exposure as possible to various environments in order to help them find their sweet spot. She also puts a strong emphasis on developing the softer skills for success in careers — such as teamwork and communication. 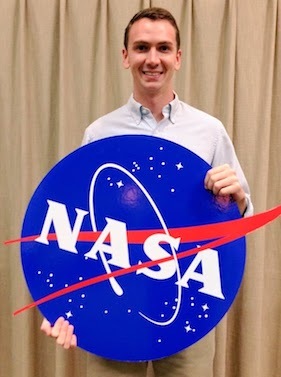 Those were exactly what Ryan Dowdy, a fourth-year Ph.D. candidate in the Department of Food Science and Technology, learned when he did his DEB internship with the Space Food Systems Laboratory at NASA Johnson Space Center in Houston, Texas. The lab is responsible for the food on board the International Space Station. The main thing he says he learned was the importance of interpersonal communication and teamwork. “Since so many people are involved on any given project, it’s essential that everyone works well together. From an industry perspective, the internships arranged by the DEB program let companies get involved in educating the next generation of researchers and also give them a chance to find prospective employees whose skills and personality might be a good match for the company. “That was 25 years ago and I haven’t looked back. It’s been a great experience,” she says. Since 2002, Novozymes has had about 26 interns from the DEB program, usually for three to six months. “We’ve been very impressed with the quality of the students. We’ve hired several of those interns after their graduation,” Yaver says. Yaver also gets involved by co-teaching the DEB seminar, Microbiology 292 every other year with Kjelstrom. 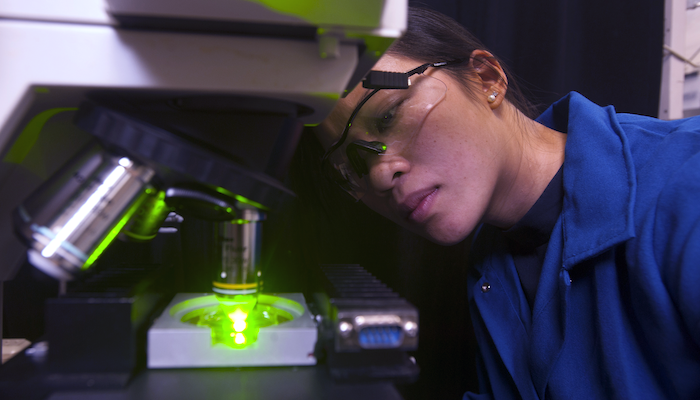 “It’s basically industrial biotechnology, from discovery to commercialization,” she says. 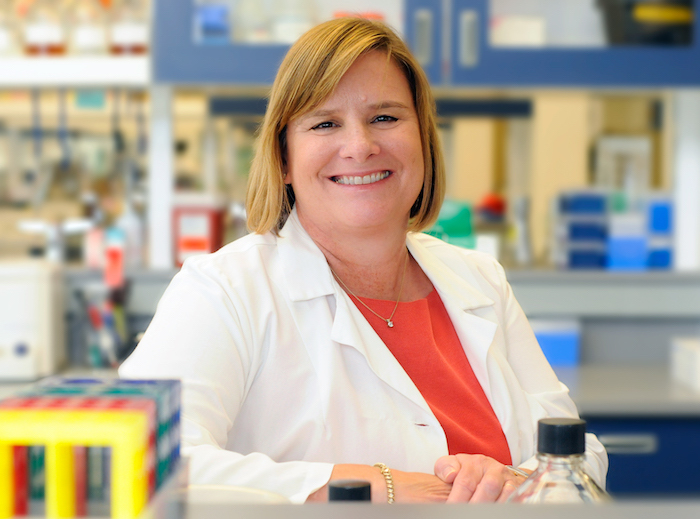 Although she works with other universities — she sits on boards at several — she says the relationship Novozymes has with the UC Davis Biotechnology Program is unique. “I haven’t seen any programs like the Biotechnology Program or the DEB at other places,” she says. Kristen Beck, technical lead for the Consortium for Sequencing the Food Supply Chain at IBM Research. 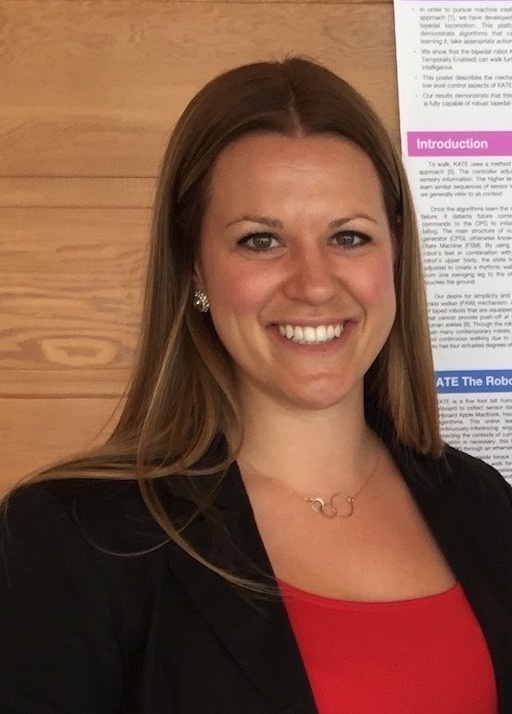 Kristen Beck, who received a Ph.D. in biochemistry and molecular biology from UC Davis in 2015, learned about the DEB program during orientation at UC Davis. “I had always been on the industry track, and it seemed like a perfect fit,” she says. She knew she was interested in research related to human health, but she had only a general sense of what that might look like for her. She credits the DEB plan with helping to demystify and broaden her understanding of the biotech industry. The program also helped her find a full-time research position in the Accelerated Discovery Lab of IBM Research in San Jose. She was originally placed at IBM with an internship, but before that started, she got a call letting her know there was an open postdoctoral position. She applied and was hired. That was two years ago. Beck now serves as the technical lead for the Consortium for Sequencing the Food Supply Chain. When she started her degree at UC Davis, she had no idea this might be a possible path for her, which is why she’s grateful for the DEB program.